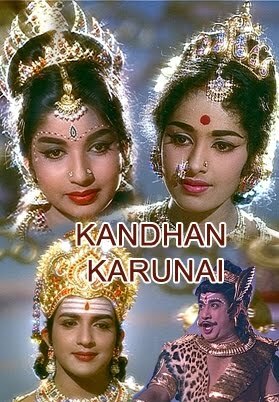 This is one of the few Tamil mythological films by A. P. Nagarajan that I’ve been able to find on DVD with English subtitles, and despite its sometimes pedestrian and almost documentary-like telling of key events in Lord Murugan’s life, it’s still worth a watch mainly due to the great cast and an excellent soundtrack. The film covers the major incidents which define Lord Murugan and his place in the Hindu pantheon and it gives a good insight into why he is often regarded as the God of Tamils. 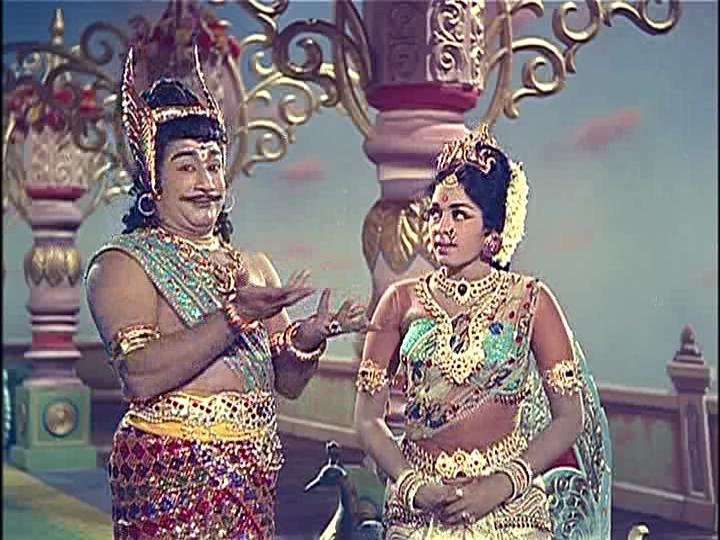 Despite his more minor role Sivaji Ganesan is the star of the show but Gemini Ganesan, Savitri and various other stars of the time make an appearance, including an incredibly cute 4-year-old Sridevi in her first ever role as the young Murugan. There are plenty of glittery costumes and even more sparkly jewellery set against some incredibly colourful sets which prove that there are no colours which clash in India. It’s garish but pretty and personally I’d like to see every army adopt the gold boots worn with such aplomb by Sivaji’s Veerabaghu. The film starts with a devotional song to Lord Murugan by renowned singer and actress K. B. Sundarambal who appears in her characteristic role of Avvaiyyar. She introduces the story of the demon king Surapadman (Ashokan) who is terrorising the people of heaven but cannot be killed due to a boon he and his people received from Lord Shiva. When Surapadman’s sister Ajamugi attempts to kidnap the king of the heavenly people’s wife Indrani (S. Varalakshmi) as a present for her brother, subsequent events force Lord Shiva to become involved. Rather than kill the demons directly he creates a son to deal with Sundarambal but gets rather more than he bargained for with Murugan. 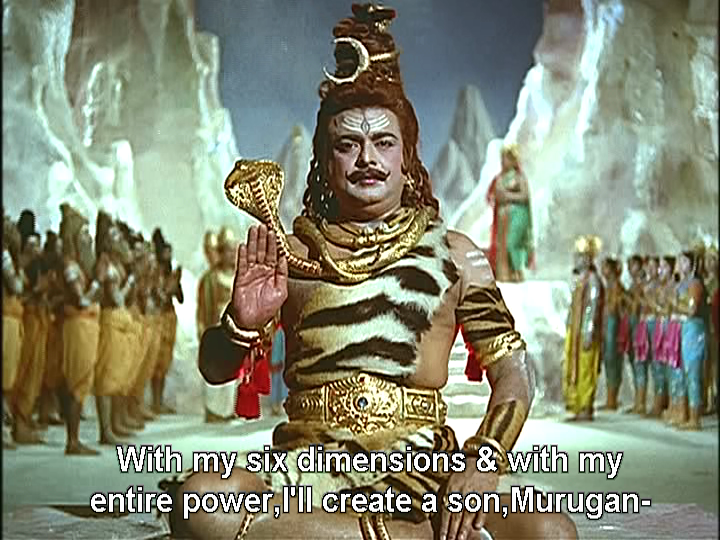 Murugan is clever, even as a child and faced with six divine girls as potential nannies, he rather practically splits into six versions of himself so that they each have a child to look after. 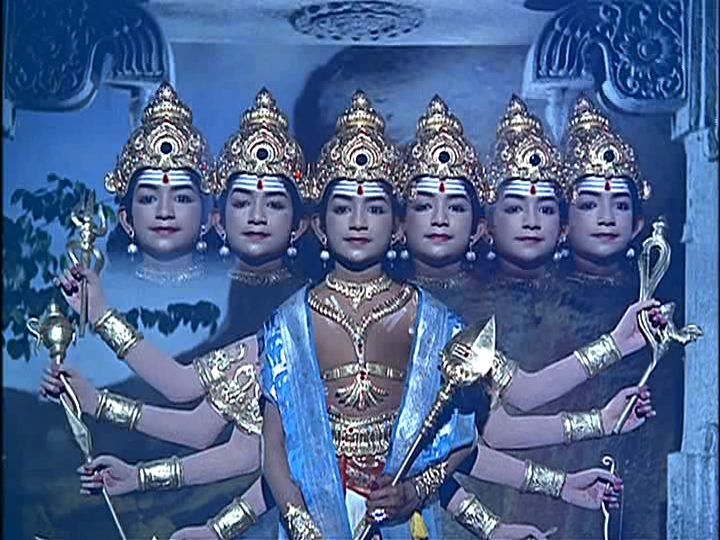 Later his mother Parvati reunites all of the children to create the god with six faces while the divine girls are rewarded by being transformed into stars. 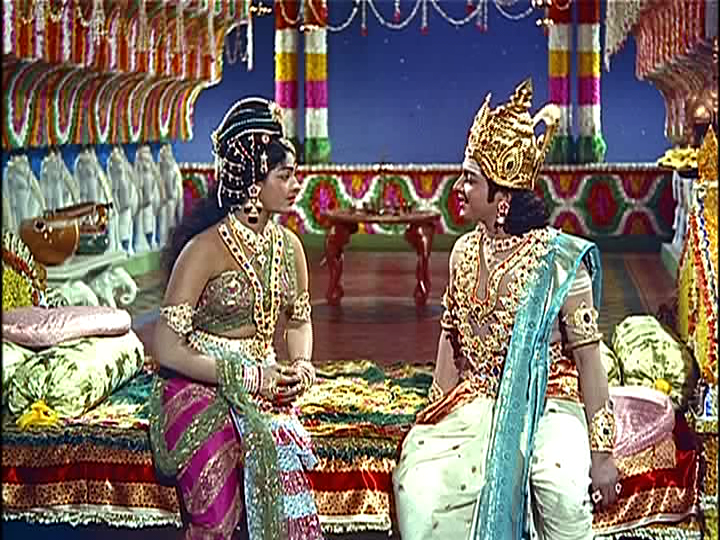 These first few stories dealing with the young Murugan are mainly told in song, although when there is dialogue Master Sridhar as the young Murugan holds his own in scenes with the older actors Gemini Ganesan as Shiva and Savitri as Parvati. The adult Murugan is played by Sivakumar who sadly doesn’t give Murugan much personality at all, and he plays the role rather passively. 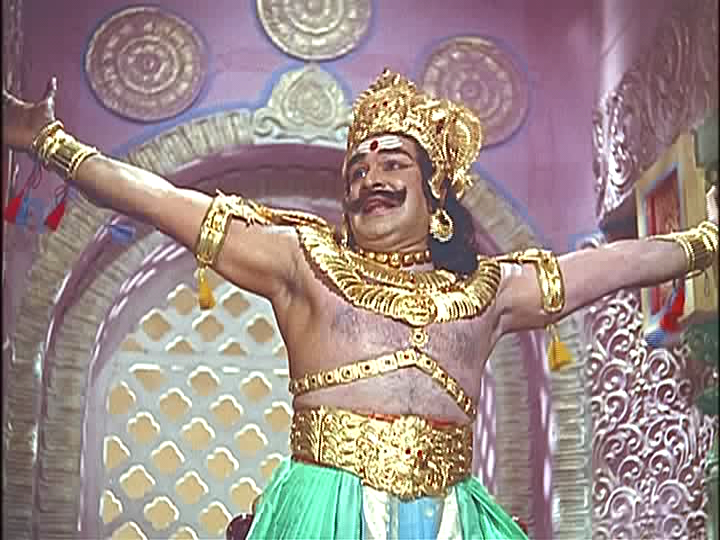 However the ‘good man’ Veerabaghu, who comes to help Murugan in his war against the demons, provides plenty of attitude and Sivaj Ganesan brings the film to life in this role. He acts first of all as a messenger from Lord Murugan to Surapadman, defying the demon’s arrogance by creating his own throne and servant girls when Surapadman denies him a chair. He is instrumental in instructing Lord Murugan how to fight the various demons and later he gets to strut around in his wonderful gold boots as the army celebrates Murugan victory. 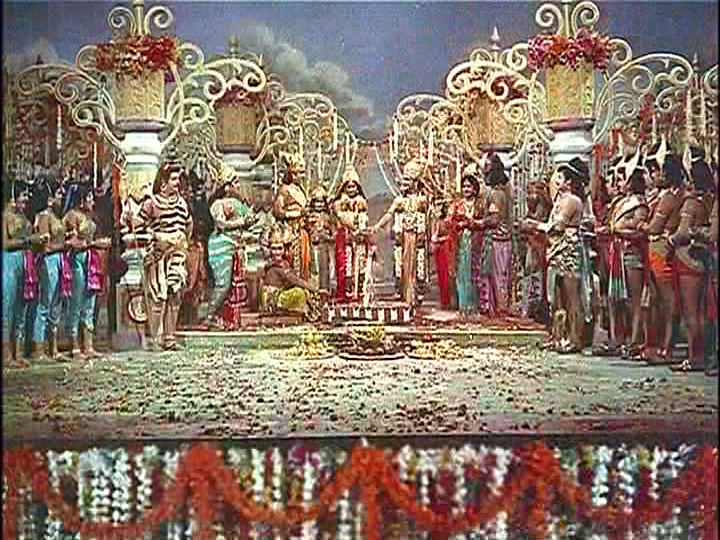 The latter half of the film deals with Murugan’s two marriages. The first of these is to Indira’s daughter Deivanai (K. R. Vijaya) who manages to stay cool when faced with the riot of colour that accompanies her marriage and subsequent first night with Lord Murugan. The explanation of marriage and a woman’s place in society sounds incredibly patronising, particularly when Deivanai is told that she has to remain faithful to her husband while Murugan goes off and finds a second wife. However, since the basic theme of an obedient wife still seems to be expounded as the ideal even in India to-day it probably sounds more reasonable to its intended audience, particularly back in 1967 when the film was made. 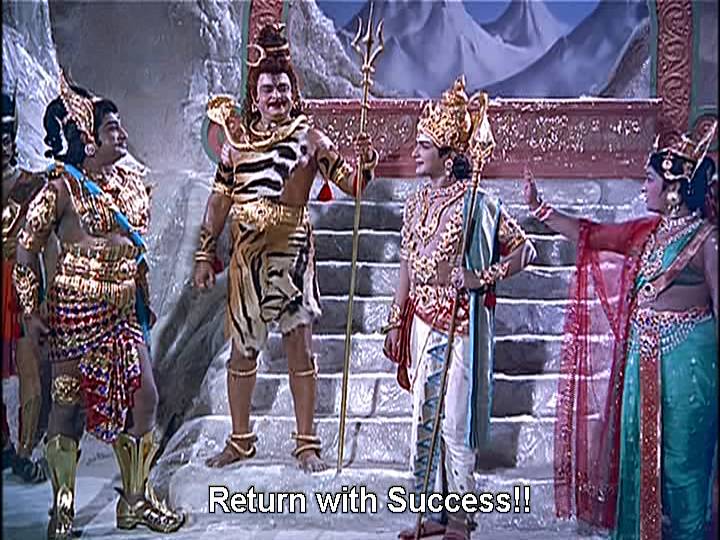 Deivanai is still understandably outraged when Murugan comes back with Valli and there are some funny moments as Veerabaghu has to deal with the two angry women, which he does with great charm and lots of sparkle. K. R. Vijaya looks beautiful but doesn’t have much scope to do anything else as her character is very one-dimensional. 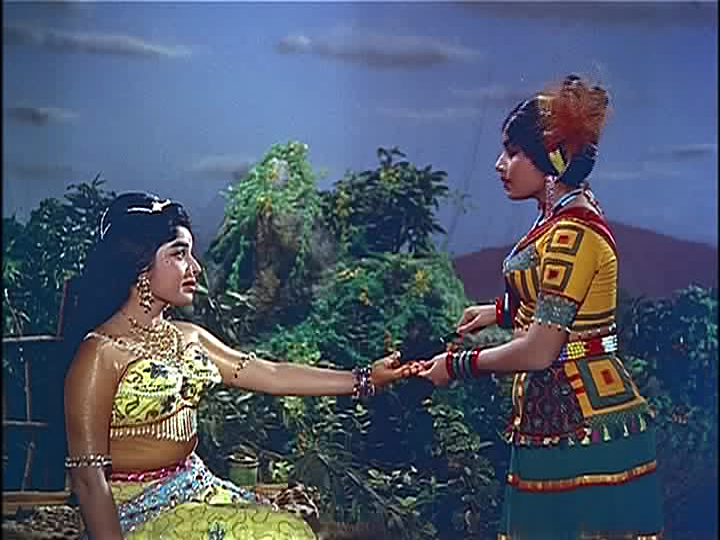 Jayalalitha as Murugan’s second wife Valli has a better role with a little more substance including this lovely introduction. Valli is the daughter of a tribal chief and her friends include Manorama and Tamil comic actor Nagesh who provide a little relief from all the noble deeds and dramatic pronouncements of the other characters. Jayalalitha is charming and her Valli is graceful and elegant even in her simple village girl persona which translates well to her rise in station as the consort of Lord Murugan. 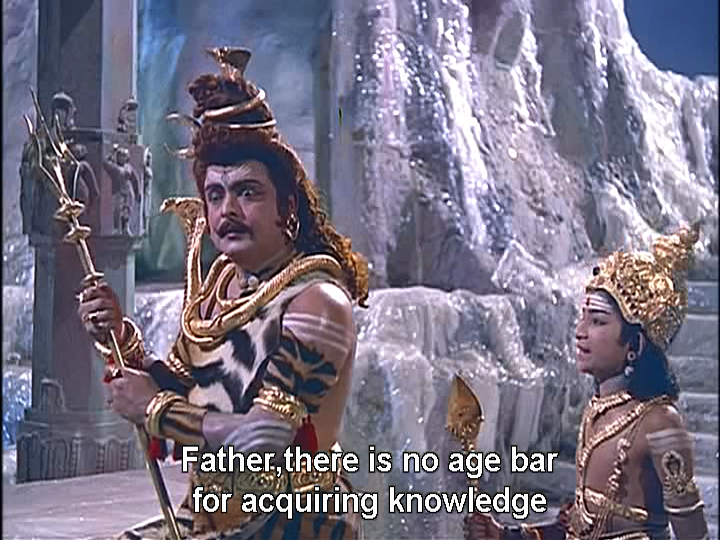 The film is very stylish and looks beautiful but lacks the warmth of other Nagarajan films I’ve seen, particularly in the character of the older Lord Murugan. Perhaps it’s because Murugan has outgrown the mischievousness and arrogance which livened up the early scenes and it’s hard to portray worthiness and knowledge as being anything other than a little dull. Sivakumar is pleasant enough but is eclipsed by Sivaji who has much more presence. The battle scenes are very stylised and the demons don’t ever look to stand much of a chance against Lord Murugan and his trusty spear, although the internal squabbles in Surapadman’s court are well portrayed. I really liked the actress who played Ajamugi who got her outrage and vindictive nature across very clearly. The music by K V Mahadevan won him a National Award and it’s definitely a highlight of the film with some beautiful vocals by P. Susheela in many of the songs. 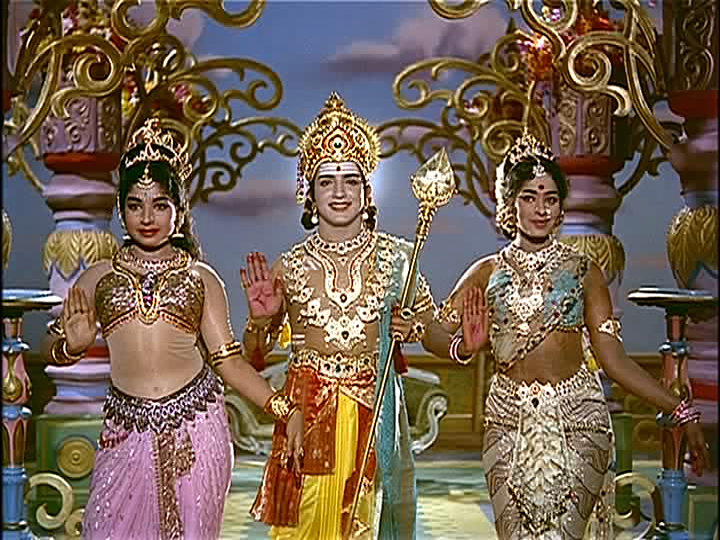 This film worked more for me as an explanation of some of the symbolism I’ve seen on my visits to temples in Tamil Nadu, and a synopsis of Lord Murugan’s life, although of course I always enjoy a film with lots of sparkle! Worth watching for the songs, Sivaji and the younger Murugan – 3 stars. This entry was posted in Kollywood and tagged A.P. Nagarajan, Ashokan, Gemini Ganesan, Jayalalitha, K.B. Sundarambal, K.R. Vijaya, K.V. Mahadevan, Kandan Karunai, Manorama, Master Sridhar, Nagesh, P. Susheela, S. Varalakshmi, Savitri, Sivaji Ganesan, Sivakumar, Sridevi, Tamil. Bookmark the permalink. 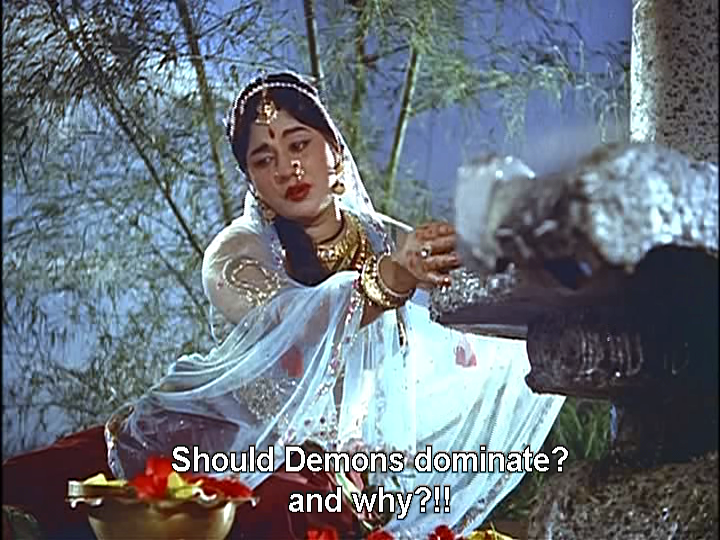 Pingback: కందన్ కరుణై (1967) « sowmyawrites ….